The Shambhala Serai brand is brought to you by the same person who created Red Capital Club and Residence. In this set of boutique hotels the owner Laurence Brahm created several unique geo-tourism lodges, the central focus of each being to provide sustainable tourism to an area in order to support the continuation of culture and heritage of the local ethnic minorities and help the conservation of the local environment. This is achieved by using only local work and craftsmen, outfitting interiors using only locally produced decorations, fixtures and fittings and hiring local staff. 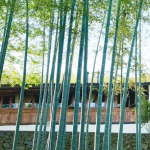 Each resort used a team of 50 Tibetan artisans and craftsmen to help authentically restore the structures, and all interior furniture and decorations are created by local women and disabled artisans who are supported through micro-financing operated by Shambhala. What is so appealing about these resorts are their deep roots in the local communities and their dedication in supporting the continuation of ethnic cultures and traditions, including its architecture. Every hotel is a historic building carefully restored to its former glory and each is located at a significant spiritual sources. 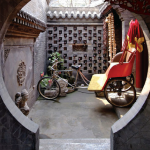 Both the House of Shambhala and the Shambhala Palace are based on traditional Tibetan town dwellings, several stories tall with sturdy stone foundations and thick outer walls leading up to rammed earth walls at higher floors and for parapets. Roofs are generally flat and constructed of timber. Each residence features an open courtyard at its centre, with exterior timber mezzanines encircling them. The House of Shambhala has a unique collection of painted panels from western Tibet, and embedded in the exterior walls of the Shambhala Palace are a series of wall carvings by master carvers. 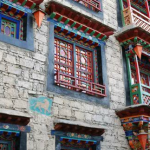 Complying with tradition, the Shambhala Palace windows and doors are surrounded with black painted frames, and colourfully decorated overhangs. Exposed timber beams and square columns are also richly decorated. The Shambhala Source is built on the sacred meditation ground where Padmasambhava is said to have meditated by the natural hot springs. The majority of the rooms have hot spring water piped directly into the bathrooms. The site, which is shared with the local nomadic people, houses a medical treatment clinic (which, amongst other treatments also uses the hot spring waters to treat ailments), as well as a manufacturing shop for producing local crafts and produce, all of which are used in the hotel, from bedspreads to lampshades. 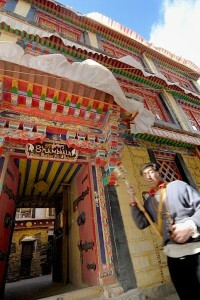 Started in 2006 and growing ever since, there are currently 3 lodges in Tibet with one further lodge due to open in 2013: The House of Shambhala and the Shambhala Palace – both in Lhasa (2006) – Shambhala Source in Terdrom (2010) and the soon to come Shanbhala Desert Dream in Gyantse. For more information on the Shambhala Serai visit their website here and for more information on how Shambhala Serai came to be, I recommend the book ‘Himalayan Notes: Searching for Shangri-La’ which can be found here.